If you’ve read our previous posts, you know several reasons to speak to a local Portland mortgage broker before you start house-hunting. You know that your first step will be contacting us, so we can set you on the right path without the mistakes and missteps that other home buyers suffer. We’ve still got plenty of tips and tools to share with you, but we realize we might be overlooking a segment of our readers. We realize there might be a good two or three people out there who don’t know why Portland is an awesome place to live. 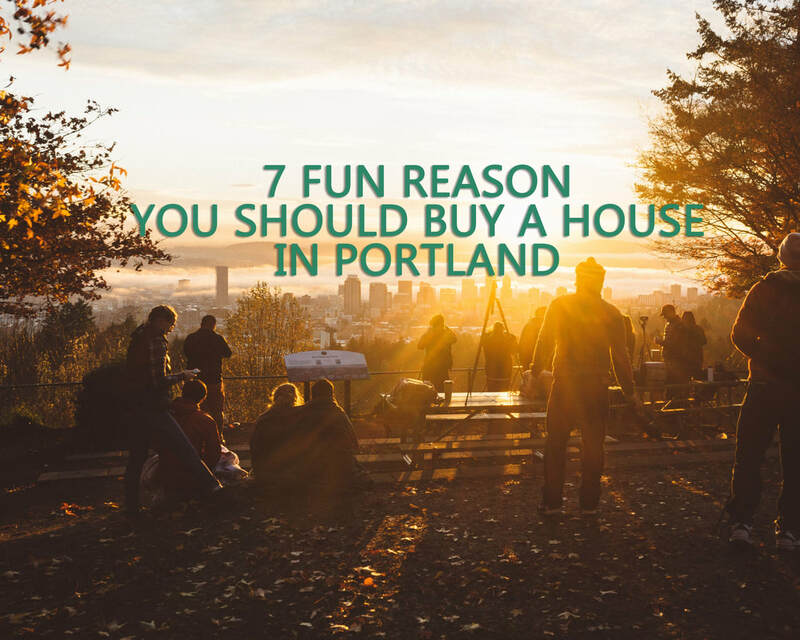 Here are 7 quick reasons why you should buy a house in Portland! ​In a world where everything seems hidden in the fine print this can be refreshing. The price you see is the price you pay. Mountains (volcanoes! ), forests, rivers, beaches, and gorgeous city architecture. Portland is in a unique spot that allows quick and easy access to a wide variety of landscapes and scenery. Portland has amazing breweries, bars, and pubs to choose from! From Gigantic Brewing Co. to Occidental, there’s a good stretch of beverage. These are the big names that newcomers hear about first. The ones that are full of fantastic Yelp reviews. Of course, there are also smaller, well-loved breweries that locals prefer. We’d be happy to give you our own favorites! More of a wine drinker? Lucky you. The Willamette Valley is at your fingertips and is flourishing with old and new wineries that rival the best in the world. ​Weather you like an old world pinot from Archery Summit, award winning Chardonnay from Domaine Serene, or modern sparkling from Argyle Winery, we never take the wine and the views in the valley for granted! The fun is in finding your favorite with the perfect atmosphere, people, location, or taste. You’re gonna need to eat. You can seriously get any kind of food in Portland. Seafood, doughnuts, steak, burgers, Indian, French, doughnuts, Southern, Soul, Cajun, and authentically Portland local spots, like Voodoo Doughnuts (for the tourists) or BluestarDoughnuts (for the locals) just to name a few. While the vast majority of Portland dining is accessible and casual, we do have our fare share of highly acclaimed and award winning chefs – Andy Ricker of Pok Pok, Greg Denton and Gabrielle Quinonez Denton of Ox, Gabriel Rucker of Les Pigeon (and others) are just a sampling of the incredible talent and innovation in food happening in PDX. We’ve all got our favorites so feel free to ask us when you come in. “I hear it rains all the time there.” It does rain a lot. But Oregon residents spend a ton of time outdoors. We really do have four seasons and within a short drive you can experience mountain air, ocean breezes, or shady forest hikes. A lot of people like the rain, believe it or not, but if you’re not a pluviophile, take heart! The best part for most is the mild climate! The average high is around 63 degrees and the average low is around 45! Portland gets over 140 sunny days per year. Even if you’re not a rain-lover, you’ll appreciate its effects. Oregon is beautifully green and lush, and Portland’s roses are breathtaking. The meaning behind Portland’s nickname of “City of Roses” is part romance, part science and we’d love to tell you about it when we meet. You’re gonna want to check out the Rose Testing Garden. If you’re moving to Portland for a job, you might already be aware of some of the awesome companies with headquarters here. Move over Silicon Valley because the Portland area is where the cool jobs are now. Perhaps you’ve heard of little companies like Nike or maybe Intel? These are just 7 brief teasers of what Portland can offer a resident. Portland is perfect for families, singles, professionals, and more. Writing up all the reasons that Portland is a great place to buy a home would take ages and not only are we too busy experiencing the awesome things Portland has to offer, but we’d rather tell you in person! We love to gush about this city! Give us a call and we’d love to give you more information about our favorite things about Portland while we help you make the first steps toward becoming a homeowner. We’re your local Portland mortgage lender so we’re experts on mortgages and Portland. You’ve got roses to see and mountains to hike, beers to try, and donuts to taste. We’ll be the mortgage experts, so you don’t have to.